磁力搅拌器操作简便，无级调速，能在较广的速度范围内对液体溶液进行精密稳定的搅拌，特别适合小体积样品的试验。磁力搅拌器可以分为不加热型、加热型、恒温型三类，有的机型增设了双向、多头搅拌功能。它是现代石油、化工、医药卫生、环保、生化、实验分析、教育科研的必备理想工具。 Magnetism Msier is operated easily,non scale changes speed,can mix liquid precisely and stably in mide speed range,especially fit little samples experiments. 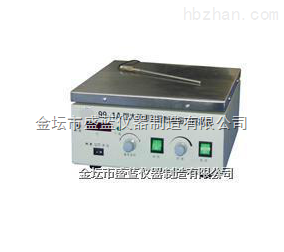 It is divicled into three kinds:no-heating style,heating style,constant temperture style some of which add two-way,multi head mixing function. It is necessary,ideal tools in modern oil,chemistry industry. Medical sanitation,ewironment-protecting,biochemistry,test analysis educational scientific research.